GoTriangle is collaborating with the Town of Chapel Hill, the City of Durham and the Triangle J Council of Governments (TJCOG) in an exciting effort to develop walkable neighborhoods that enhance Durham and Chapel Hill's existing communities and leverage the high-quality transit network that will be provided by the Durham-Orange Light-Rail Transit project. We are working with outside experts, local elected officials and neighborhood leaders to help design neighborhoods that best meet the goals of the local communities. Visit this page for updates on the latest progress on the study, copies of presentations given to local elected officials and other reports, and upcoming opportunities to share input into the study. Along with the specific events listed here, the project team has held numerous discussions with local staff in many government departments to move the project forward. In particular, staff members at the town, city, GoTriangle and TJCOG have worked extensively on the issue of affordable housing within transit station areas with the consultant team, which includes local affordable housing expert Karen Lado. The team has also investigated potential joint development opportunities around station areas. This effort is funded largely by a $2.1 million grant awarded by the Federal Transit Administration to help plan the station areas around the light-rail project. The project is anticipated to be completed by spring 2018, and station-area planning efforts will continue until the light-rail line opens and thereafter. NEW: Staff from the Town of Chapel Hill and the consultant team gathered input from members of Chapel Hill advisory boards on how to make sure that station areas produce transit-oriented development that reflects the community’s goals and provides benefits to the entire town. Here is the presentation given at the joint advisory board meeting held Monday, Oct. 16, 2017. The transit-oriented development team has released a market study and demand forecast for the Durham-Orange Light-Rail Transit corridor with accompanying appendices. This economic analysis predicts the magnitude of growth that is reasonable to expect within the areas around light-rail stations. The report uses historic growth data in the region and forecasts of growth to provide a range of estimates regarding the economic development potential of these station areas. On Monday, May 8, 2017, the consultant team and Triangle J Council of Governments hosted a developer breakfast at the Research Triangle Foundation headquarters. Following brief presentations by the consultant team and local planners, local developers and affordable housing experts held a panel discussion about the challenges and opportunities for doing development in Chapel Hill and Durham and about the region's readiness for equitable transit-oriented development that brings opportunity for people across the income spectrum. Information gathered from this meeting will help guide the development of realistic land-use plans for each of the station areas. The Town of Chapel Hill is working with GoTriangle and its consulting team to prepare appropriate land use plans and development standards for the areas around the six planned light-rail stations within town limits: Gateway, Woodmont, Friday Center Drive, Hamilton Road, Mason Farm Road and UNC Hospitals. The goal is to maximize the community benefits of new investments in transit service and promote the development of walkable neighborhoods that will enhance Chapel Hill’s existing communities. The effort began in February 2017 with several public events. The map shows the area around the Gateway station. The majority of the area within a half-mile of the station is within the Town of Chapel Hill limits, in both Orange County and Durham County. 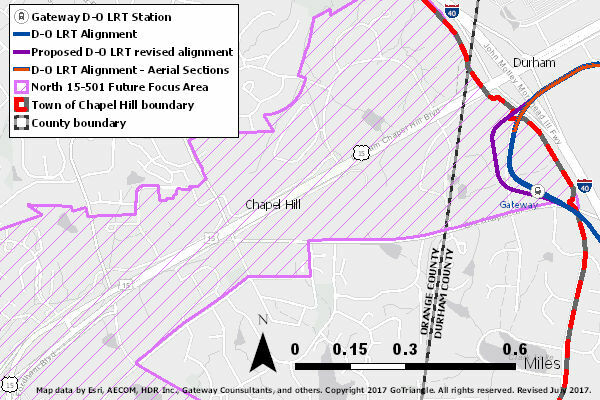 Much of the station area is also within the North 15-501 Focus Area identified in the Chapel Hill 2020 comprehensive plan as a site for further study due to its high development potential. In February 2017, the project team held a series of work sessions and public workshops to develop preliminary concepts for each of the Chapel Hill stations. The team gave a presentation to Chapel Hill Town Council on Monday, Feb. 13, introducing the effort.On Wednesday, Feb. 22, the team kicked off the design work with a public meeting at the Chapel Hill Public Library. From Thursday to Sunday, the team met with local stakeholders and drafted preliminary designs for each of the station areas. During those four days, the team held two open houses where members of the public visited the work space and provided input on the progress. Finally, on Monday, Feb. 27, a presentation at Chapel Hill Town Hall gave the public an opportunity to review the results of the workshop. The team wrapped up the workshop effort by presenting an update to Chapel Hill Town Council on Monday, March 13, 2017. On Wednesday, May 24, 2017, the project team held a workshop with members of the six Chapel Hill advisory boards and commissions charged with reviewing development applications. Following an introductory presentation, town staff and the consultants received board and commission input about the desired characteristics of redevelopment in the station areas and the relationship it would have to development elsewhere in the town. On Monday, June 12, 2017, the project team presented to Chapel Hill Town Council about its progress and received guidance for future steps. By a 7-1 vote, the council authorized the project team to move forward with the next steps in the project. First, the team will consult the town's advisory boards and commissions to gather more details about the community's priorities for development in each station area. Second, the project team will begin a formal process to draft appropriate development standards for the Gateway and Woodmont station areas that the council could then enact through Ordinance and Zoning Atlas amendments. Both stations provide an unusual opportunity for redevelopment and consist largely of private land that could be redeveloped in the future. For the other four station areas where UNC owns much of the land, the team will coordinate planning efforts with UNC's ongoing update of its master plan. Following up from the council’s direction, town staff members and the consultant team met with members of the six Chapel Hill advisory boards and commissions on Oct. 16, 2017. The team and advisory board members discussed the process for developing zoning regulations for station areas, the project schedule and community goals that should be prioritized. The presentation from this workshop is available online.